Submitted by Dan Dooré on Thursday, May 24, 2018 - 11:35. An arcade/adventure in the Dizzy mould written in GamesMaster . Yipe! Talk about a scary cover for a computer game - a Gothic affair covered with women in beards and mad images! 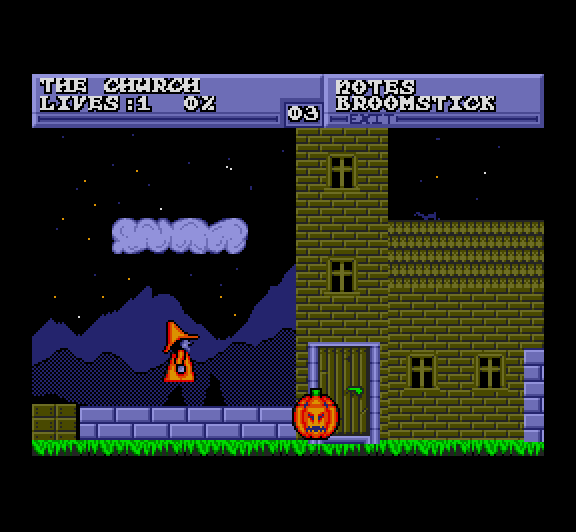 Though, the game is not a patch on the Gothicness of the cover. 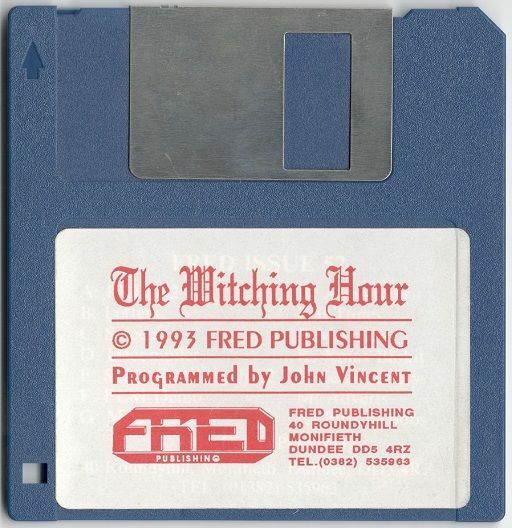 The Witching Hour, as it is, is the period of time which you, Gretta the good witch or Beardy the wizard (non-sexism on the Coupe!!) have got, to destroy the Demon Master, who has captured all the villagers of a small sea-side town, bar a few remaining survivors. The non-Gothicness shows in the game, straight after a nice looking introduction, we are in the thick of arcade action… Well, a Dizzy type of game, but a game which oozes a certain amount of atmosphere. Yep - you know that sort of game by now! Pick up objects, take them to places and use them. The game has some added dimension about it, though. For a start, you can enter doors of buildings and look inside them for objects. The game also gives you some helpful (or non-helpful depending on your game-playing) tips when you examine objects. 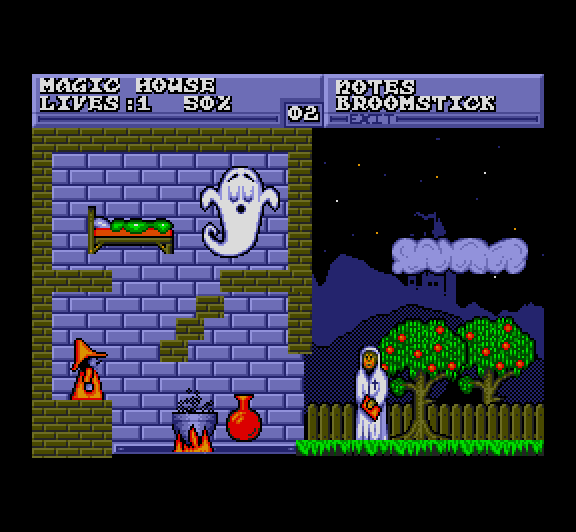 You can only pick up two objects at a time, and there are certain hazards to overcome, including some rather large ghosts, a hazardous (and well animated) river, and much more. 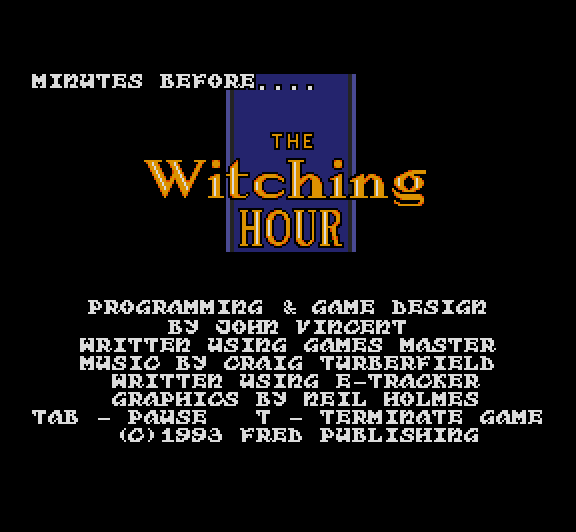 The game itself has been written using the Gamesmaster utility by John Vincent , and it is quite a triumph to write a complex game like The Witching Hour (in programming terms) on Gamesmaster. Though this leads to two minor niggles. One is that there is a short pause while you pick up objects, use objects, etc. where the screen turns black, but this is bearable. The other is that it is a bit awkward to control your character, especially when he/she is jumping. You have quite a wide berth when you jump, and sometimes you know that you are dead just as you leave the ground, knowing your flight path will lead to a ghost. Though it is something I am getting used to very quickly, a bit like when Spectrum owners got used to Dizzy, so I am reserving this niggle on the marking. Graphics have been drawn by Neil Holmes - now of console fame(! )and they are quite colourful, though not colourful enough to shatter the mood of the game. Music has been done by the wonderful Search: “Craig Tuberfield” (Lemmings ) and the title track is extremely tuneful. All in all, if you enjoyed Boing! 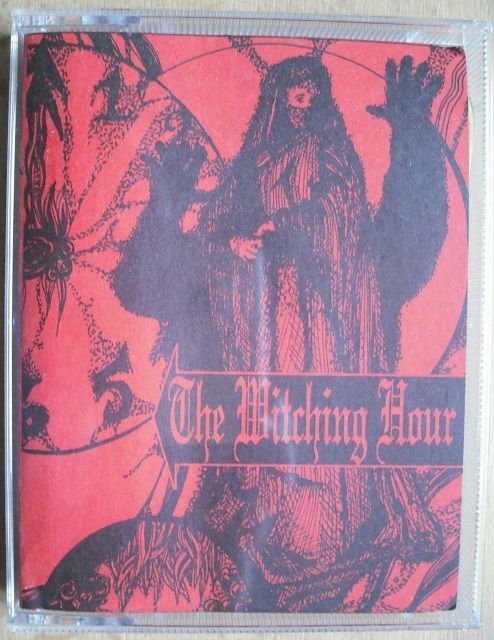 or are an avid Dizzy fan, give yourself an inexpensive treat and purchase The Witching Hour. Nice graphics, nice music and that addictive “one more go” quality lacking in a handful of SAM games.